WARNING- post is very photo heavy. The decorations for our wedding were really important as I wanted lots of visual loveliness to look at all throughout the day. That is the reason why this post is coming in two parts as there is quite a lot to share. Todays part is concentrating on the outside areas and barn. The next part will be concentrating on the inside of the marquee. I knew I wanted signs directing people to different areas on the day, I also wanted them all to link so all signs were written in white either on wood or chalkboard paint. I wrote all the signs myself and although I am not the best at typography I was pretty pleased with the outcome. The first sign was at the entrance from the car park pointing our guests in the right direction. 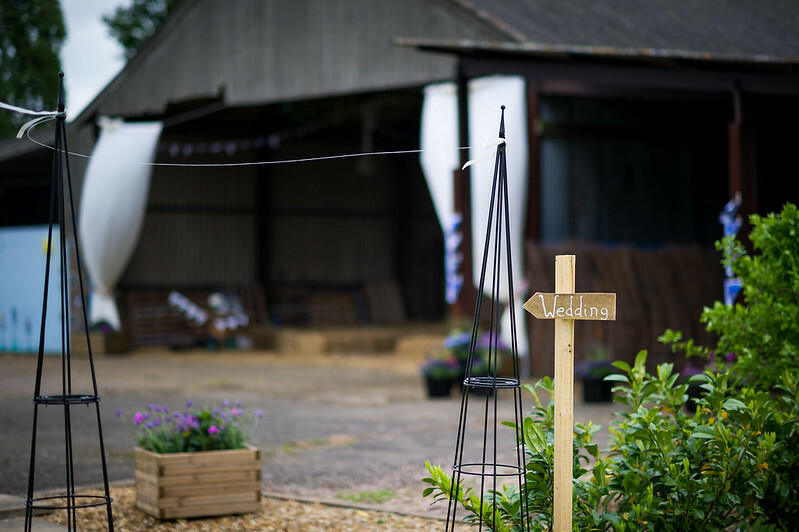 Once you got to the barn and there was a welcome sign on bunting and one informing people where to sit, we wanted it to be very casual so no brides family/grooms family. 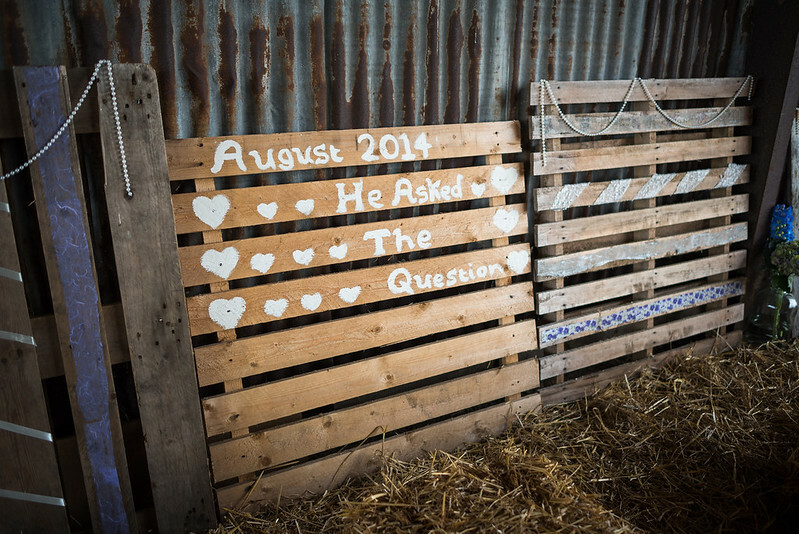 We also had the order of events leaning up at the side of the barn. I found this long plank of wood in another barn at Mum's and thought it was perfect. I used no nails glue to stick each section of the order of events onto it. We then also had two other signs, one directing people to the different areas we had and another just before the bell tent village. 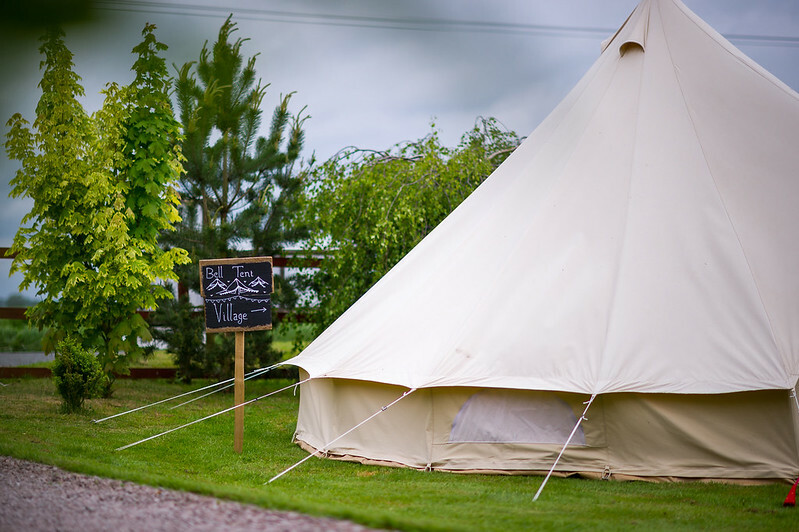 The bell tent village one was actually my favourite as I cannot draw for toffee but it actually came out pretty well. 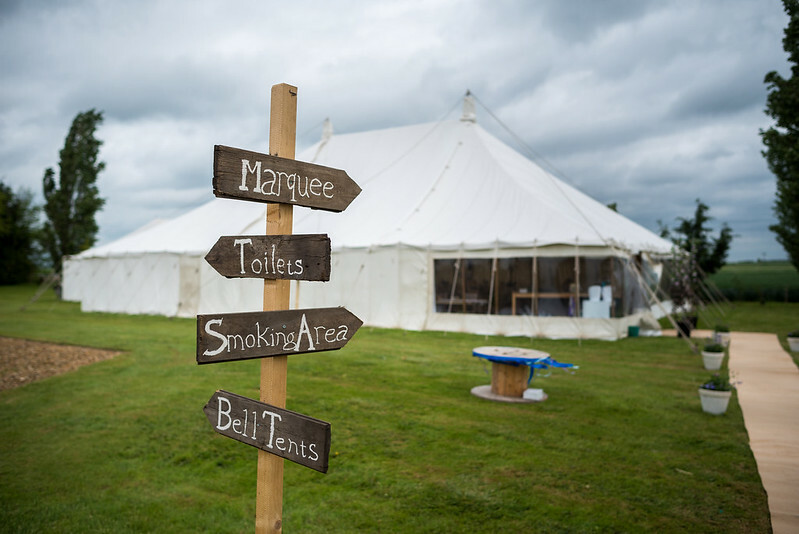 The signs really helped create the look and feel we were going for with a slight festival theme, if we had brought these they would have cost a fortune but they were all made from bits of spare wood and then cut and shaped the way we wanted them. 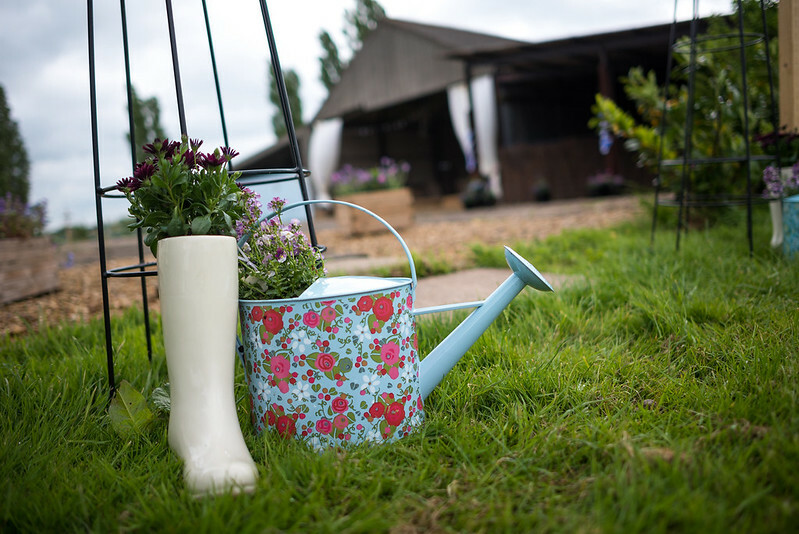 As people were walking from the car park to the barn it was really important to have pretty little things to look at, lots of this was created through flowers in different place. I had a whole variety of plant pots myself and Glenn's Dad Keith also had a ridiculous amount of pots, along with large wooden boxes that were used for Glenn's sisters wedding. We were so lucky with the flowers because Keith works in this industry. We went to a garden centre with him showed him what we liked and he went off to buy them and then potted them all creating a stunning set up of flowers that reflected our colour theme. The same goes for inside the marquee but more on that in the next post. Not only did we have flowers but I also printed out large polaroid style images from our engagement shoot. 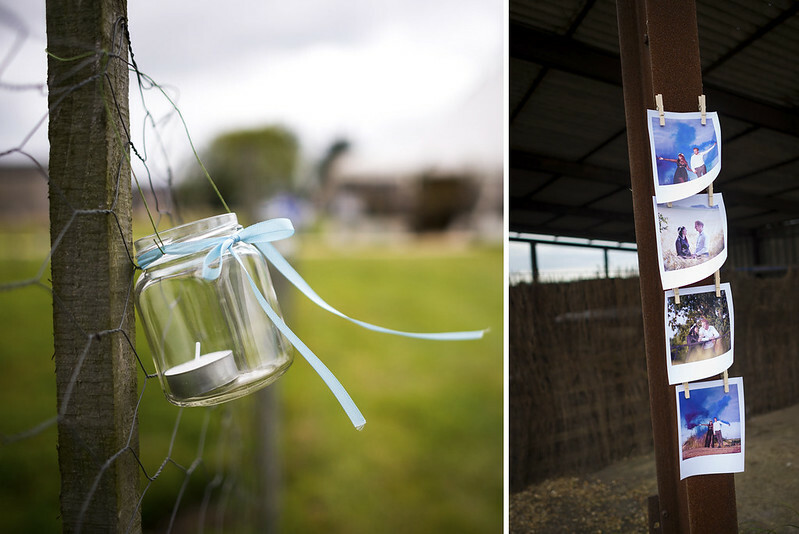 It was ridiculously windy though and I was scared they were going to blow away, some how they managed to stay along with most of the outside ribbon candle jars. 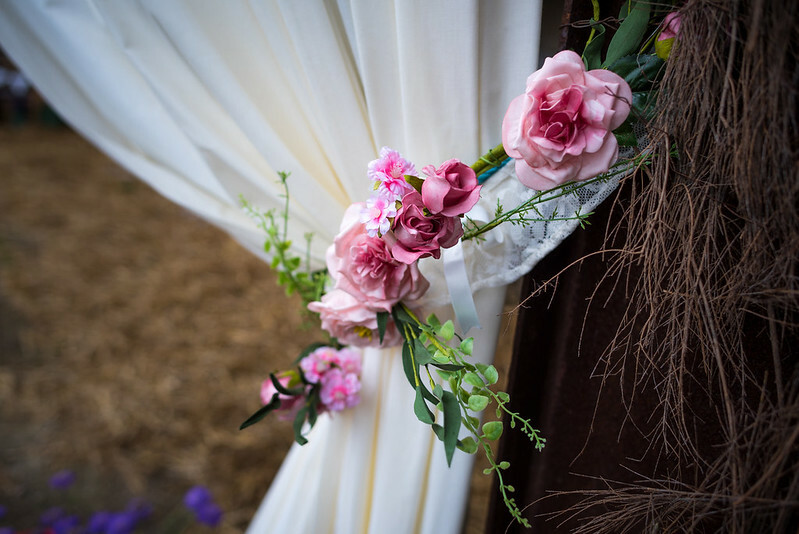 The outside of the barn was decorated with two large curtains my Mum made, these were held back with some flower garlands we found at the range, and in front were more wooden boxes filled with the beautiful flowers Keith planted. Our main outside decoration was the love sign seen at the start of this post, it was Glenn's idea and he cut the letters out of chipboard with my Step Dad. We painted it together and I added the colour around the edges. We also painted it with glow in the dark paint but you couldn't see this until it was completely pitch black so didn't work as effectively as we had planned. I knew I wanted the old leather rocking chair next to it as it turned into a selfie station which is what we both had in our head. Seeing all the 'love' pictures on Facebook after the wedding from our guests was so enjoyable. 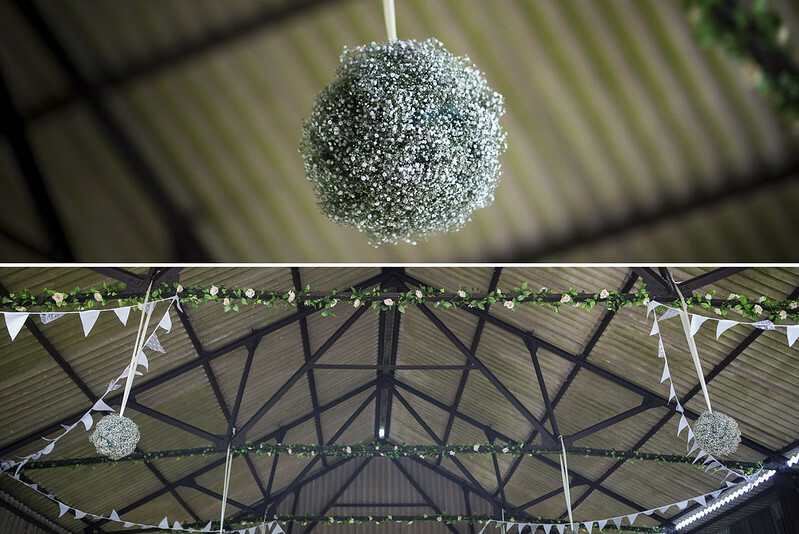 The roof of the barn was decorated with white bunting, faux champagne rose garlands from eBay, (not great close up but far away like they were in the barn looked great) and real gypsophila balls. 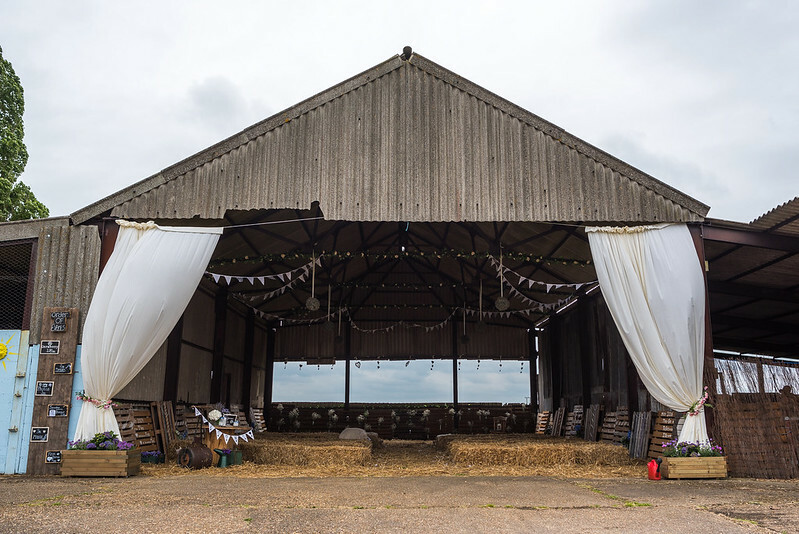 Everything in this barn was all put up by ourselves, I spent a good few hours up scaffolding tying bunting and wrapping the garlands round the poles. We then all had a panic attack watching my Step Dad up a ladder tying the gypsophila balls. All of these decorations are currently still up which makes me smile every time I go to my Mum's. 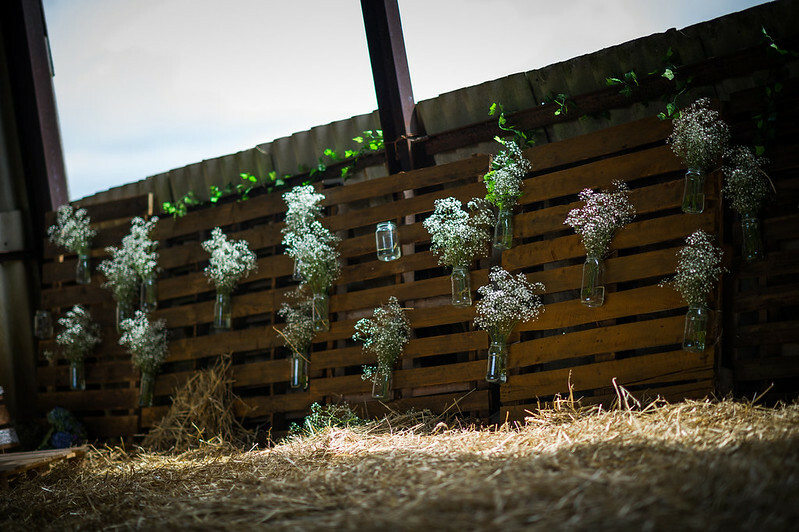 The barn also had the back wall filled with palettes with jars attached to them, again filled with gypsophila. Every single jar we attached to the palettes ourself, very time consuming but looked so effective. 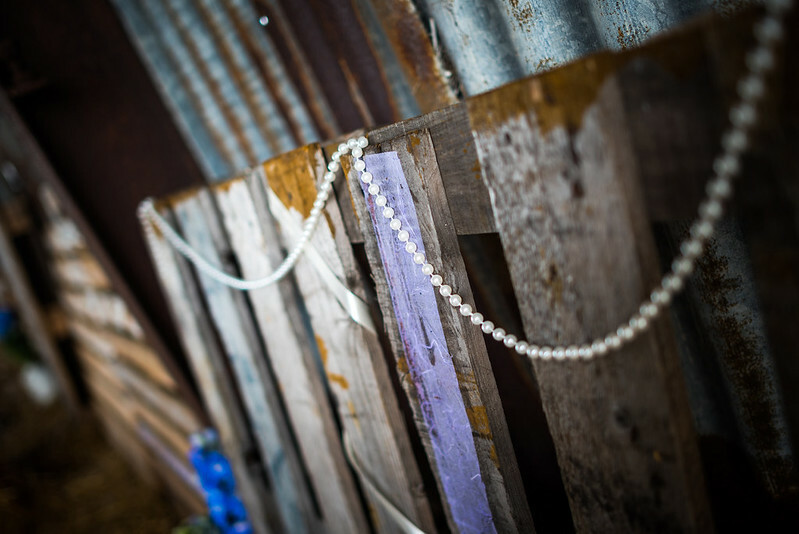 The other two sides of the barn were also decorated with palettes, some I had staple gunned lace onto them, some I had decoupaged and draped pearls over and then others had the story of Glenn and mines relationship. 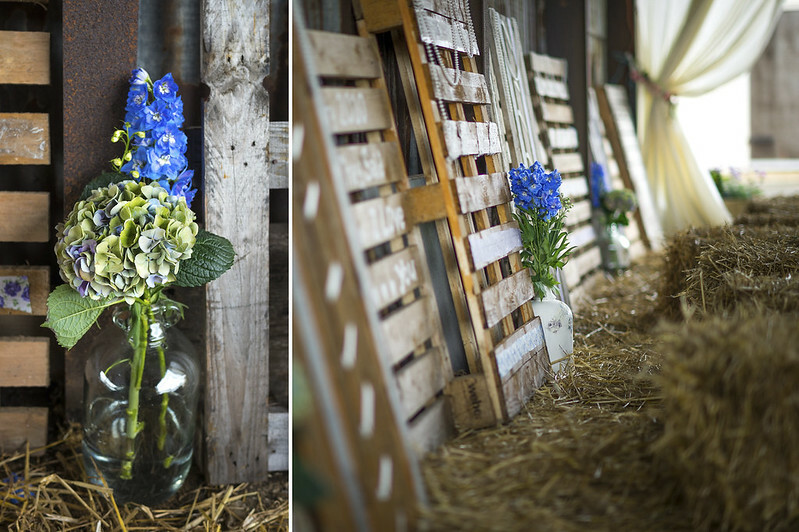 The barn also had demi johns dotted round filled with flowers of our colour theme, blue and purple. 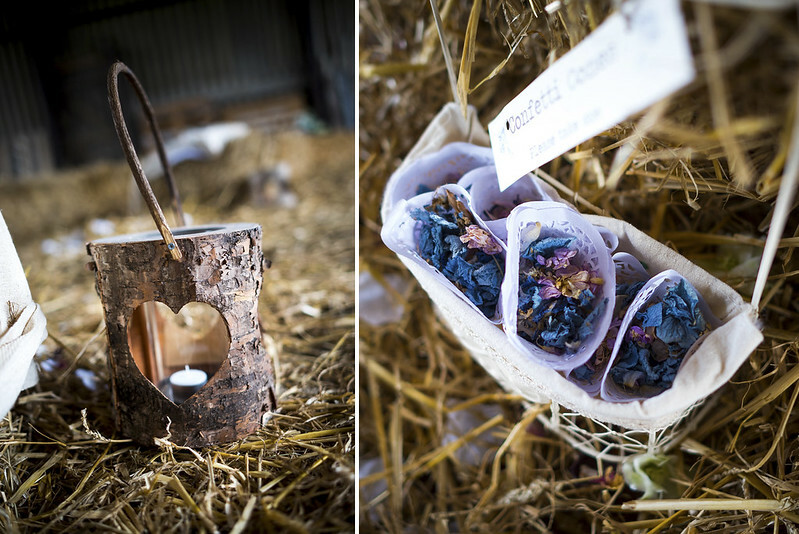 The finishing touches were the lace straw bale covers my Mum made, petals running down the aisle with metal holders at each end filled with confetti cones. The end of the aisle was then finished off with the wooden heart candle holders. Another great purchase from the range. We covered the floor of the barn with straw as the concrete wasn't pretty to look at, the straw floor really looked effective. 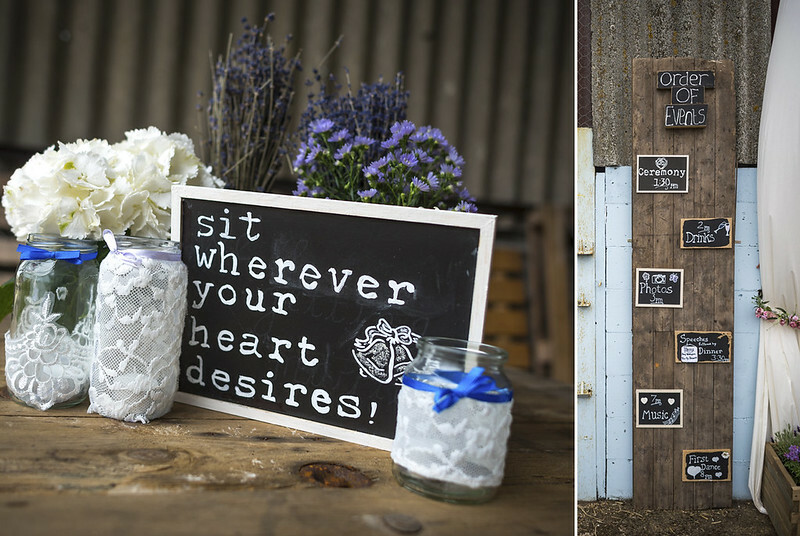 Writing this post has made me realise how much we actually did to decorate the barn. I remember seeing everyone sat in there waiting for me to arrive thinking how happy I was with the way it looked. When you work really hard at something and all your close family and friends help to make it possible it made the day even more special. The beautiful setting pretty much took care of the event. Not to mention the fact that these guys were flexible in allowing us to really make the experience our own. We still receive compliments from our guests about the DC wedding venues, the service and the food.